Forget multivitamins or fish oil, or whatever’s billed as the secret to longevity these days. The REAL secret is not just to live long, but to live long HAPPILY. Right? And I know the secret to that: puppies. Plenty, apparently. 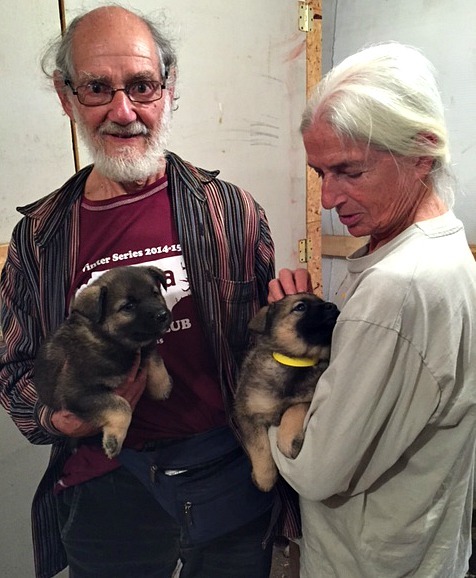 He started talking–mostly about the two new puppies he and my mom just brought home. They’ve been sending pictures, so this wasn’t news. What WAS news was how much OTHER news my dad had to share. We talked about his recent trip. My recent trip. The puppies. A book he loved. A book I loved. The puppies. My children/his grandchildren. My cousin. Puppies. When I hung up, my phone informed me we’d been talking on the phone for FIFTY-FIVE MINUTES. For my practically phone-phobic, 85 year-old, serious scientist dad? That’s a world record by more than double. Don’t you just feel happier already? I’m not really suggesting anyone give up vitamins or fish oil. But I do think it’s worth considering the power of something utterly charming to boost the latter years of a long life. I’m going to remember that when I’m 85. This entry was posted in Wing's Words and tagged cute puppies, dogs, longevity, Norwegian Elkhounds, puppies, secret to a long life by gretchenwing. Bookmark the permalink. Puppies! 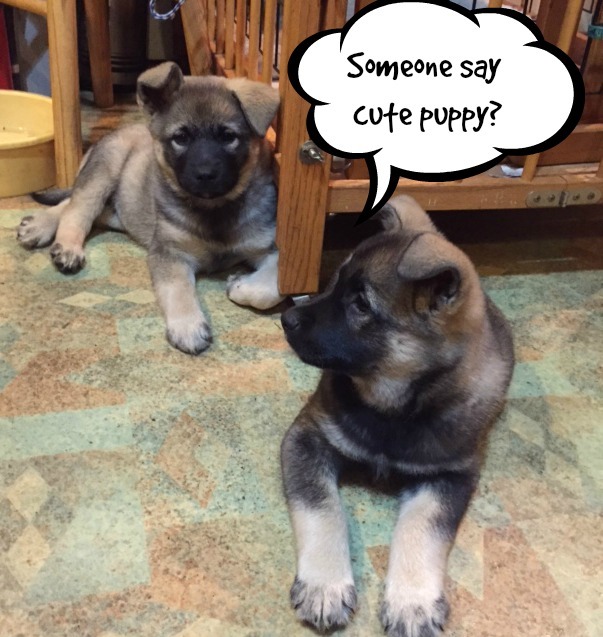 Elkhound puppies! SOoooo adorable! I absolutely believe that puppies can extend life and make it lots sweeter and more charming. Our Corki-dog, who is a pitty/Viszla, is almost 9 now. He was an amazing, somersault-turning pup, once upon a time. I figured that one would hook you at least! Thanks for sharing the love & puppies!